Unlike the survey methods discussed previously, signals corresponding to ground penetrating radar (GPR) depend on a multitude of physical properties. The most important physical property to GPR is the dielectric permittivity (\(\varepsilon\)), as it greatly influences the velocity, attenuation, reflection, refraction and transmission of radiowaves. These concepts will be presented in the following section. Dielectric permittivity is considered the diagnostic physical property for GPR. In addition to the dielectric permittivity, the propagation of radiowaves through the Earth may depend significantly on the electrical conductivity (\(\sigma\)); provided the electrical conductivity of the Earth is sufficiently large. Radiowaves will also reflect off of very conductive objects buried in the Earth. If the Earth is magnetic, we may also need to consider the role of magnetic permeability (\(\mu\)). In order to better understand the link between the dielectric permittivity (\(\varepsilon\)) and electromagnetic waves, let us consider a microwave oven. We know that microwaves heat food using electromagnetic radiation, but how do they work? Fig. 87 Electromagnetic waves in a microwaves. Within a microwave oven, there is a source which generates high-frequency electromagnetic waves (f = 2.45 GHz). These waves move at roughly the speed of light (c = \(3.00 \times 10^8\) m/s) and have wavelengths of about 12.2 cm. We can see from the figure on the right, that EM waves support electric and magnetic fields which oscillate. The walls within the microwave are made out of materials which reflect elecromagnetic waves. As a result, the walls designed not to heat up while the microwave is on. Fig. 88 Oscillating electric and magnetic fields being carried by an electromagnetic wave. Image source . All foods contain water to varying degrees. Water is unique from most other molecules because it is naturally polarized (carries an electric dipole moment). This property of water molecules makes them align with electric fields very easily; giving them a high dielectric permittivity (\(\varepsilon_r\) = 80). When electromagnetic waves come into contact with the water molecules in the food, the water molecules physically re-orient with the oscillation of the wave. This is because of the oscillating electric field carried by the wave. For waves at 2.45 GHz, this is occurring over 2 billion times per second! Fig. 89 Polarization of water molecules. (A) Disordered water molecules. B) Water molecules rotate to align with E-field. C) Water molecules polarized under E-field. The magic of microwaves is their operating frequency. At roughly 2.45 GHz, water molecules absorb the energy from electromagnetic waves and become agitated. The heat energy generated by the physical movement of the water molecules is then transferred throughout the food. 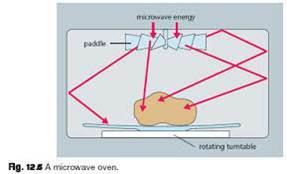 Therefore, microwaves work by heating water molecules with electromagnetic radiation. What about the turntable or glass of the microwave? The glass and plastic which make up the window and turntable of the microwave have low dielectric permittivities. As a result, these materials do not become polarized by the incoming microwaves, making them non-reactive. So what have we learned from this example? Very conductive materials will reflect incoming electromagnetic waves. Materials containing water will become polarized from electromagnetic waves. Some materials do not absorb electromagnetic radiation easily. The operating frequency of the source has a great impact on the response of materials.